Marisa Tomei won her first and only Oscar because of this film. It was just one of another great film with Joe Pesci. And it had that Ralph Macchio from The Karate Kid in it, as one of his last best roles. And they all play New Yorkers stuck in an Alabaman murder trial. You’re already laughing, aren’t you? Released in 1992, Macchio stars as Bill Gambini, a teen who’s driving through Alabama with his friend and is suspected of committing murder after some unlucky timing. They are brought before court with Judge Haller (played by Fred Gwyne, that famous guy from the old timey The Munsters show) and have a flimsy lawyer, John Gibbons, who’s played by Austin Pendleton. I have to say, if that’s not the most Gil Gunderson esque looking person, then Jack Lemmon steals the deal. (REFERENCE ALERT: Gil Gunderson, a lowlife character on The Simpsons, is based off of Jack Lemmon’s character from Glengarry Glen Ross). Knowing that Gibbons basically acts like a vacuum, Gambini gets his cousin Vinny (Pesci) to come down and represent him. 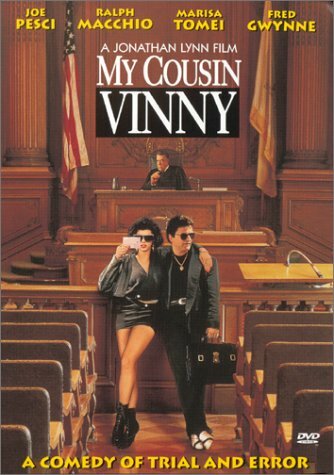 Vinny isn’t the most successful or routine lawyer, but he knows his way around technicalities. His girlfriend, Mona Lisa Vito (Tomei), comes to his help plenty of times during the film, and provides for plenty of laughs. The constant “foot in mouth” kind of scenes just deliver the movie’s great laughs and it just helps knowing how different the North functions from the South. Whether it’s about “grits” or “yutes,” there are so many funny scenes to choose from that you can’t stop laughing. The unconventionality of Vinny in trying to secure his cousin’s and cousin’s friend’s lives provides for an entertaining aspect on the justice system. Definitely the precursor to that “perm” speech Elle Woods delivered in Legally Blond, hearing Vinny talk about the cooking time of grits just makes sense. The sheer triviality of something that would just be overlooked in real makes it all the funnier, suspending belief in the viewer while delivering comedy with every line. It’s definitely a must watch for anyone- if you want to be a lawyer or if you want to drive cars, this is the movie you need to watch. I give it a 9/10 ★★★★★★★★★ since it’s the type of funny that everyone laughs at- its unconventionality plus word choice in writing just add humor to the already funny situation.